At the time of this writing, we see violence in our weather patterns all over the world. News articles come out almost daily now about what we want to call “natural disasters”. However, they are far from natural as the following news article excerpts show. Something astounding is going on and the elders in the Arctic Circle are telling us that even the position of the earth relative to the sun and stars has changed. NASA certainly is saying nothing about this but these elders are anything but idiots about their domain in the far north. It serves us to listen to these natives who live close to the earth, sun, moon and stars. Many dramatic events are coming about and the day in January when the sun came up two days early in Greenland we should have taken more notice. World scientists could not come up with a reasonable explanation so none was provided but they did reject the idea that the earth’s orbit changedin any way. Since then we’ve seen a staggering number of signs indicating major changes are unfolding. Something has provoked a profound alteration to conditions on our planet driving the atmosphere and earth into convulsion. The weather continues to be beyond worst-case-scenario expectations of weathermen everywhere. Epic floods, massive wildfires, drought and the deadliest tornado season in 60 years are ravaging the United States, with scientists warning that even more extreme weather is on the way. From all points on the compass come reports of natural disasters. Life is getting extremely uncomfortable for earth’s populations as record heat, cold, rain and drought conditions are recorded. The earth’s magnetic shield is weakening and is in the process of having its magnetic field reverse with magnetic north moving at 40 kilometers a year south toward Siberia. Financial collapse in the face of disasters of nature will bring our contemporary civilization to the brink of anarchy and there is little we can do but prepare our families. The world as we know it is coming to an end. And what will follow will not be pleasant or easy. …the elders at the top of the world…are telling us that the position of our precious earth has changed but that does not address why it changed. Scientists are telling us that the huge mega quakes in Japan, Chile and New Zealand actually have thrown the inclination of the planet off by a few inches. Naturaldisasters that are already occurring are apocalyptic to those who suffer through them. Let’s face it — we are up against something stupendous that will send most of us scrambling — too late — into preparation mode. All of humankind is threatened by simultaneous apocalyptic horsemen riding tough on dark stallions. Monster tornadoes, historic floods, massive wildfires and widespread drought: Springtime has delivered a wallop of weather-related destruction and misery across much of the nation this year. And it may all be related. Never mind the debate over global warming, its possible causes and effects. We’ve got “global weirding.” That’s how climatologist Bill Patzert describes the wide range of deadly weather effects that have whipped the nation this year, killing hundreds of people and doing billions of dollars in damage to homes, businesses, schools and churches. “Sometimes it gets wild and weird,” says Patzert, a research scientist at NASA’s Jet Propulsion Laboratory in Pasadena, Calif. Unusual and severe weather always raises questions about whether global warming, the slow rise in world temperatures, whether natural or caused by humans, is to blame. In addition, vector-borne diseases, diseases in which the pathogenic microorganism is transmitted from an infected individual to another individual by an arthropod or other agent, will change in their distribution as the climate changes. “Populations will be on the move as food and water production is threatened; these so-called environmental refugees, that the world has already seen, suffer a variety of increased health risks,” added Schwarz. “The rule of thumb is that every degree increase in temperature decreases the wheat harvest by 10 per cent,” said [Bill] McKibben, speaking about the effect climate change has on global food production. “Food cost has increased between 70 and 80 per cent in the last year for basic grains. For millions around the world, they are already affected by not having enough. [William] Ryerson sees a bleak future for water-starved countries like Saudi Arabia. The word environment, as we see used in this article, is rendered firmament in the Holy Scriptures. This is word #7549 in the Hebrew dictionary of Strong’s Exhaustive Concordance. Everyone can see that the events that are taking place in this time period are not normal. Things are getting worse. The scientists are saying there are no signs anywhere on the horizon that would indicate any change for the better is near. The big question is, why are these things occurring? The big problem is, no one wants to admit the real cause; nor will they repent. Yes, repent, because what has changed and damaged the earth, the firmament (atmosphere), and the water—things that were made for mankind and absolutely necessary for survival—is the breaking and changing of Yahweh’s Laws. Everyone needs to read the book, Birth of the Nuclear Baby, or request the 6/2007 issue of The Prophetic Wordmagazine, which contains the article: The Real Cause of Global Warming. You cannot get this information anywhere else. 2 And many nations will come and say; Come, and let us go up to the mountain; uplifting of Yahweh, and to the House of the Father of Yaaqob, and He will teach us of His Ways, and we will walk in His Paths. Because theLaws will depart from Zion, and Word of Yahweh from Yerusalem. In verse 2, we see the Word of Yahweh will depart from Zion. Notice the Words of Yahshua concerning Yahweh’s Laws and Yahweh’s Kingdom being taken from them. Yahshua knew that the Pharisees and their roman army would destroy the temple, move the artifacts to Rome and plow Zion like a field, because the Holy Inspired Prophets of Yahweh foretold these things, and Yahshua believed the Prophecies. This iniquity was the doing away with the Laws of Yahweh—the daily reading of the Laws in the temple. That is, they will replace the Laws of Yahweh with the pagan teachings and practices of the lord of heaven. It is a Law of Yahweh that kept the Laws being read daily in the temple. However, the daily reading of the Laws revealed to those who heard the Laws that the violent priests who persecuted Yahweh’s Prophets were sinners. So, in order to stop the Laws of Yahweh from being read and the sin offering from being offered, they had to destroy the Worship of Yahweh and the place where He was worshipped. 4 Whoever commits sin, trans-gresses also the Laws; for sin is the transgression of the Laws. But Yahshua said to them: Do you see all these things? Truly I say to you: There will not be one stone leftsitting on top of another, which will not be thrown down. This took place around 70 A.D. (C.E.) The Pharisees had their roman army destroy the temple, move the artifacts to Rome and remove the stones of the temple, after burning it, and plow Mount Zion like a field. The Pharisees, Sadducees, and Essenes moved to Rome and took the name Catholic, which means universal. Rome is the city that brings profaneness to all the world—the leaders of the kings of the earth. The city that sits on seven hills is the Vatican. They still fight against the Name Yahweh and the Laws of Yahweh, the Laws of Righteousness. Therefore, they will not repent. The following Prophecy is being fulfilled in and around the great River Euphrates now; a third part of men will be killed, as prophesied, in that fourth part of the earth. It’s happening before your eyes now; yet, the religions won’t believe what the Prophets have spoken, nor will they repent. The religions today are more corrupt than in the days of the Prophets and the Savior. The crusades of the Catholic popes were geared to destroying all of Yahshua’s followers in and around the hills of Galilee. History shows there were trillions of people killed in the horrible crusades, down to and including the American “Indians” as they were called by the popes. The Native Americans came to this land from the hills of Galilee because they were fleeing for their lives. They worshiped Yahweh, sang songs to Him and even kept Yahweh’s Sabbaths until their culture was destroyed by the crusades in America. You need the books: Birth of the Nuclear Baby, The End, The Mark of the Beastand the 02/2011 issue of The Prophetic Word magazine. These religious imposters are called liars. They deceive and are deceived themselves. 21 Therefore, put away all filthiness and the superabundance of wickedness, and receive with meekness;humility, the written Laws, which are able to save your souls. Deception does not bring Salvation. It brings death. The religions will not repent. They will continue in their deception. They killed the Disciples because the Disciples taught that they should repent. The Savior said you’re a fool if you don’t believe all that the Prophets of Yahweh have spoken. The Prophet said that Mount Zion would be plowed like a field over eight hundred years before it took place. He also said that in the Last Days Yahweh would establish His House in the chief of the nations. America had not been discovered by Columbus at the time of this Prophecy, and was not discovered until 1492, just 519 years ago. Yet, it was prophesied to become the chief of the nations, the place where Yahweh would again be worshipped and also hated in this Last Generation; because Yahweh’s House is prophesied to bring Yahweh’s Laws of Righteousness to all nations. For full details on The House of Yahweh established and the Two Witnesses and their Work, request our booklet, The House of Yahweh Established and the Two Witnesses packet. Remember, Yahshua said Yahweh will not be worshipped in Yerusalem. The next prophesied Work of Yahweh is for the Last Days, which is the Work of the Two Witnesses. The Two Witnesses were prophesied to be born in the Last Days and take Yahweh’s Message to all nations from the chief of the nations. They were also prophesied to be hated above all people on the face of the earth. Both of these prophecies have come to pass. We are indeed hated above all people, as were the Savior Yahshua and Father Yahweh. And they are still hated today. Yahshua said to search the Scriptures for the Work of Yahweh. Then He says, you’re a fool if you don’t believe all that the Prophets have spoken. The Two Witnesses are not the leaders of the nations. They are the warners of the nations. Their Message is going out to all nations at this time, a time period called the Last Days and Last Generation, as was prophesied by the Prophets, Apostles, and Savior. Remember, the whole world is deceived. So, at the same time the Two Witnesses are taking the Laws of Yahweh to all nations, the whole world is deceived into believing that the Laws of Yahweh were done away with, as Daniyl prophesied the beastly system would do. Yahweh’s Laws cannot be changed. The religious leaders can only claim they have such authority to change them, but they lie. They are also cursed for deceiving the people into believing their lies. The religions are all liars. They have changed Yahweh’s Sabbaths and Feast Days, which are protection from things to come. So, if they can get you to believe the Sabbaths are done away with, they can rob you of your reward. Remember, believe all that the Prophets have spoken. The Prophets show you clearly that Yahweh’s Feasts are His Shadow from things to come. Plus, by keeping Yahweh’s Sabbaths you prove obedience to Yahweh, which brings life. Notice, be obedient and live. The popes can’t give you life. None of the religious leaders can give you life. Only Yahweh, the Lawgiver, can give you life. 16 And one of you says to them: Depart in peace, be warmed and filled; but you do not give them the things which are needed for the body; what does it profit? 17 In the same way, the faith, if it does not have works, is dead, being alone. 18 Yes, a man may say: You have faith, and I have works. Show me your faith without your works, and I will show you my faith by my works! Notice, don’t lose your reward. Verse 18 says, let no man deprive you of your reward. Let no man deceive you. In Colossians 2:17, we see the Feasts are a shadow. The Sabbaths are a shadow. They are Yahweh’s Feasts and Yahweh’s Shadow for His People from the nuclear wars that are to come. This makes you belong to Yahweh by following His Righteousness. Read those verses again and compare the ones that follow. The beastly system changed Yahweh’s Feasts and Laws in the minds of those they deceive. It’s your choice to follow those who changed Yahweh’s Laws, but you are told by Yahweh’s Inspired Prophets not to follow them. Take note of this, no one keeps Yahweh’s Feasts in the Place Yahweh chooses to place His Name in these Last Days except His House. You are commanded by Yahweh, Who only can give life, to seek His House called The House of Yahweh. It’s your choice. No one seeks Yahweh and His Righteousness, except those of The House of Yahweh, established by the Two Witnesses in the Last Days. 8 You must not at all do as we are doing here this day—every man doing whatever is right in his own eyes. In verses 4 and 6, we see those who keep Yahweh’s Sabbaths are the ones He gives these promises to. In verse 5, Yahweh says, I will give to them in My House even within My Walls. Notice, He doesn’t give to anyone except those in The House of Yahweh. Also in verse 5, He says He will give them the Name (of Yahweh), which means Authority. This is the original Plan. This authority or rulership will not be given to anyone outside of Yahweh’s House; only to those who will allow Yahweh to make them into the Image and Likeness of Yahweh. The religions today are not teaching the people Yahweh’s Laws, Statutes, and Judgments, which make one in the Image and Likeness of Yahweh. They only teach the traditions of stupidity—rabbits laying colored eggs on Easter Sunday in honor of the pagan Goddess Easter, Santa Claus going to every house in a sleigh pulled by reindeer and crawling down the stove pipes of houses and Halloween, memorials to or worship of the dead. Yahshua said to let the dead bury the dead but you come and follow Me to Yahweh’s House where Righteousness is taught. Don’t let anyone stop you from serving the Creator as prescribed in His Laws or they will take away your reward. You can repent and start seeking Yahweh’s House and His Righteousness. 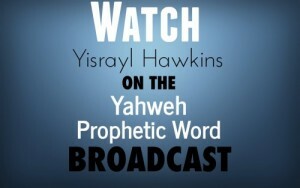 You can and should make plans now to come to Yahweh’s Place of Protection. The next Feast, which is the Feast of Tabernacles, is tentatively scheduled to begin October 12 at sunset through October 20 at sunset. The reward goes to those who will come out from among the sinning religions, repent, and start practicing Yahweh’s Laws of Righteousness and Love. Call, write, or email for more information and request a Feast packet. They’re all free of charge. Need help in getting here? Let us know. The Feast of Tabernacles will tentatively start October 12 at sunset. May Yahweh bless your understanding.